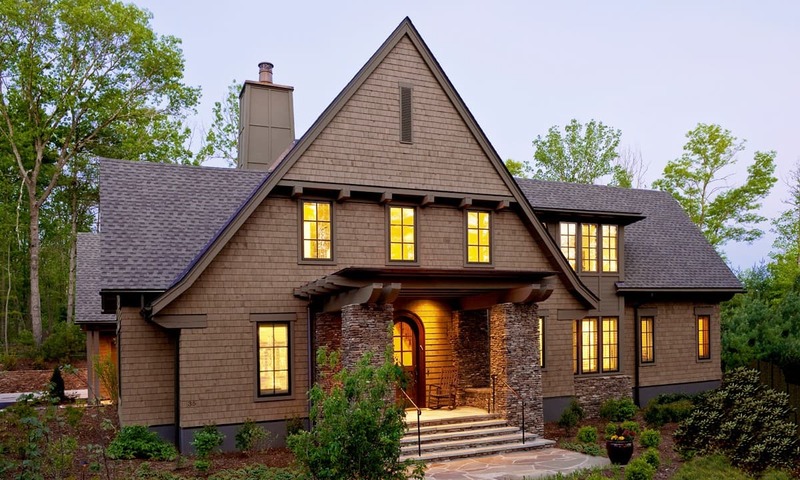 The Ramble Residence is a shingle style house that was designed for our retirement age clients in the Ramble at Biltmore Forest neighborhood of Asheville. The vision for the home was to create a traditional and comfortable feel to the interior and exterior while maintaining a modern and open floor plan. The exterior combines simple roof forms with cedar shingles, wood timbers and stone detailing. We designed the timber and stone at key locations so we could achieve the effect we wanted while still working within our client’s budget. The interior is customized to meet the specific needs of our client’s everyday life and includes accessible design and other aging in place concepts – if they are needed in the future. The main living spaces open up to a covered terrace, lawn and garden which expands the living space and creates a strong indoor-outdoor connection.